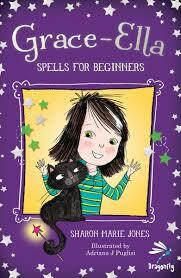 Grace-Ella: Spells for Beginners by Sharon Marie Jones is such a fun, delightful read. It tells the story of Grace-Ella who on the ninth day of the ninth month of her ninth year discovers she is a witch. Her world changes dramatically, suddenly filled with magic, spells and excitement. Grace-Ella needs to learn how to use her magic and make sure she never breaks The Nine Golden Rules of the Witch Academy. But can she do it? The wonder of this book lies in its celebration of individuality. Grace-Ella adores her two quirky friends, and doesn’t want to change them at all. Despite some children at school and her mother’s fear of what other people think, Grace-Ella stays true to herself as well, not feeling like she has to conform. Grace-Ella is the kind of girl everyone would like to have as a friend. She's mischievous, curious and incredibly loyal. She gets into scrapes and causes mayhem but you root for her all the time. The importance of friendship and sticking up for each other really shines through. The story is written in such a fun magical way, and I love how the characters and place names are in Welsh. The illustrations by Adriana Puglisi are beautiful – adding such depth, warmth and laughter to Grace-Ella’s tale. I imagine children 7+ will adore this book. I can’t wait to read about Grace-Ella’s next adventure.